Time: Dinner will be served at 6:45 p.m. and the meeting will begin at 7:00 p.m.
Topic: "Swim. Bike. Run. Avoiding injury in the triathlete"
Dinner will be served. To help our sponsor prepare, please RSVP to holly@ssi-physicaltherapy.com or Trudy_messer@bshsi.org by Friday, Oct. 9 at 5 p.m.
SCAPTA members will receive a free CEU. We encourage non-members to attend, however, there will be a $10 charge to receive the CEU certificate. Hope to see you there! Join PT's, PTA's, students and other PT staff across the world who have pledged support of the Global PT Day-of-Service! Let's make October 17, 2015 an amazing day centered around a strong professional movement. Any service activity can count towards participation. The Global PT Day-of-Service team views service as any activity contributing to the betterment of your community. This could mean serving in a soup kitchen, cleaning up a community park or garden, or work in a pro bono PT setting. Specific service opportunities are not coordinated by location, but the Global PT Day-of-Service team is happy to provide ideas for how to get started. If your act of service takes place within one week of October 17, 2015, you can still post your stories and pictures to be counted towards the grand total. Visit www.ptdayofservice.com for more information or to pledge support. South Carolina is filled with facilities offering exceptional physical therapy services, and we want to make consumers, practitioners and vendors aware! 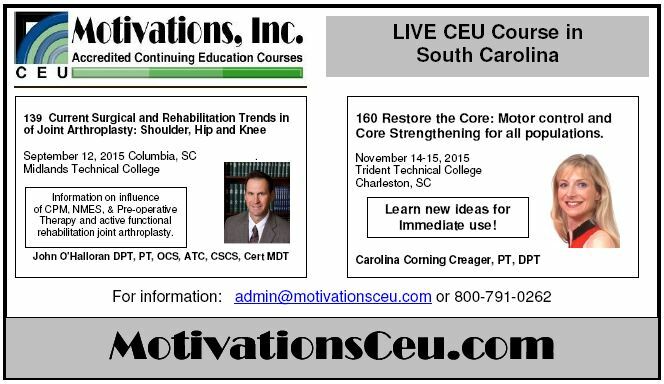 The South Carolina Chapter of APTA (SCAPTA) is accepting proposals for educational sessions for its Annual Conference to be held May 6-7, 2016 at MUSC in Charleston, SC. We welcome PTs, PTAs, and all others with expertise in the topic of their presentation to present a proposal for this conference. Proposals will be accepted through September 15, 2015. See the proposal form here. The call for Poster Presentations is also included here. Please help spread the word about this opportunity by sending this to anyone you believe may have an interest in submitting a proposal. Held by the South Carolina chapter of the American Physical Therapy Association (SCAPTA) to celebrate October National Physical Therapy Month and benefitting SCAPTA and partial proceeds towards Charleston's Achieving Wheelchair Equality (AWE). James Island County Park in Charleston, S.C. Achieving Wheelchair Equality is a Charleston, S.C., organization that serves the wheelchair using community and mobility impaired population in order to become involved, productive members. They educate and increase awareness to others about accessible resources in our environment for those with mobility impairments whether it be with daily activities with peer support and direct services including building ramps or in participation in recreational activities such as the Lowcountry Wheelchair Sports including and not limited to basketball, tennis, racing with hand cycling, swimming, triathletes, and more! Watch this page for more information regarding sponsorship opportunities and registration. Section on Pediatrics Annual Conference (SoPAC) will be held Nov. 6–8, 2015, at the Wyndham Grand Hotel in Pittsburgh, Pennsylvania. Four pre-conference courses will be held Nov. 4-5. The 2015 SoPAC theme is: "Convergence of Knowledge and Research into Practice." SoPAC includes 18 hours of all-pediatric programming with concurrent sessions from all pediatric practice areas. The SoPAC Schedule-At-A-Glance and registration information can be accessed at www.sopac.us. Should you expand your practice?